← Have you ever taken the time to think about what’s in a name? Homemade gifts are the most treasured gifts. With Father’s Day this weekend, I am sure the younger kids have made things for dad at school. These gifts have so much more meaning than store bought gifts. I have another simple homemade gift idea I wanted to share with you. It can be used for many different occasions – Father’s Day, Mother’s Day, birthdays, anniversaries, etc. 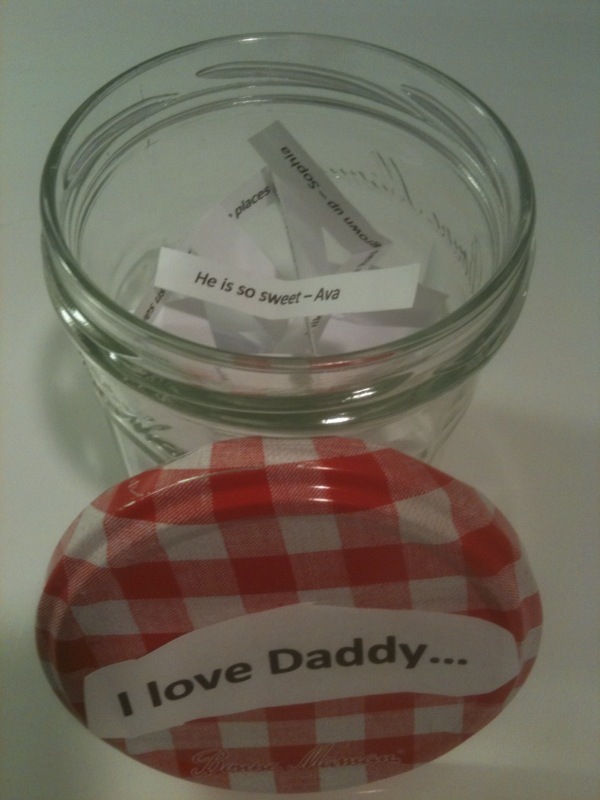 – Put the little strips of paper in a jar or box. It is simple and meaningful gift… a creative and wonderful keepsake. Such a great idea! It reminds me of having a ” I am thankful jar”. What a wonderful idea! Thanks for sharing. Lovely idea…..The best things in life are free! Happy Father’s Day Dads! Great idea. Tanya & Tanvi did something similar … Made an iDad (iPad look) with paper and had 12 icons under which they had written reasons why they love me … Some reasons were quite flattering, but who am I to disagree! Also made a sampling platter of 4 of my fav desserts … Tiramisu, Molten Lava Cake, Zuccini cake slice and Coffee Ice Cream (only thing that was store bought). My fav day of the year … Makes me feel special and even more loved! Happy Fathers Day! Wow! Impressive! That’s wonderful. Happy Father’s Day! Did this for mom on mothers day and she loved it! It is definitely a great idea!